When we think of the new, cool, sporty side of Cadillac that has emerged over the last few years, the CTS, and specifically the CTS-V, is the car that comes to mind. 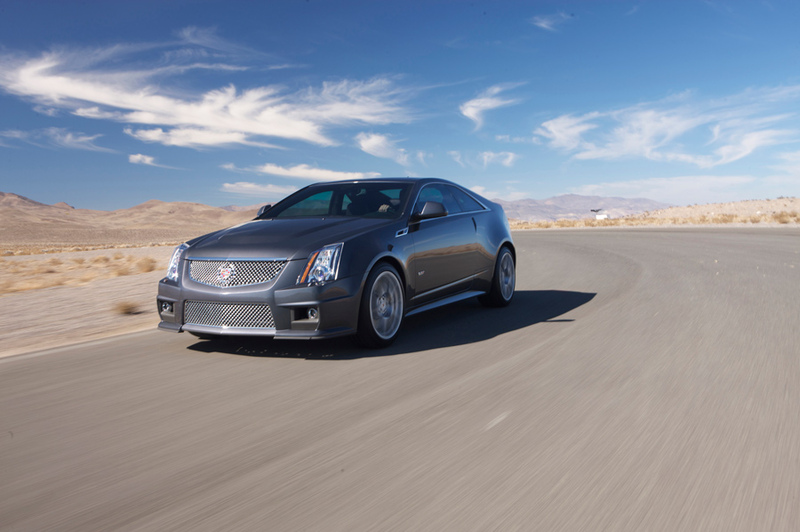 The CTS-V has been with us since way back in 2004, and has been a reigning super-sedan ever since. For the 2011 model year, GM expanded the appeal of the second generation CTS-V with a neat sport wagon and a very distinctive coupe. For 2014, Cadillac is reworking the CTS lineup yet again, so this year will be the last of the first generation CTS Coupes. Luckily, we were able to really put a 2013 CTS-V Coupe through its paces as we took it on a long road trip to the famed Masters golf tournament in Augusta, Georgia. Such a drive allowed us to both put on the cruise control and to give all 556 horses a real workout, so we were able to get a good sense for what this Cadillac is all about. Now, for many the CTS-V Coupe has been an appealing car ever since it came out, and a 500+ horsepower Caddy with a six-speed manual will definitely garner some interest, but can this older design live up to the high expectations of 2013? From the outside, it’s hard to call this two-door CTS pretty, but it’s not unattractive, either. It’s really just unique, and in a world where the only way to tell most any two new cars apart is by the badges, that’s refreshing. In a profile view, the hunkered down front end contrasts nicely with the somewhat big caboose, and almost looks like a dart. Unique to the CTS-V are the larger dihedral grille for more airflow as well as the 19-inch forged aluminum wheels. Our test car also had the optional red calipers for the Brembo brakes. These, combined with the not-so-subtle “V” badges on the doors and tail made for nice detail touches on this undeniably bold design. Things are not so rosy on the inside. Next year, the interior on the CTS will be all new, and this is a good thing. The cockpit of our test car was, to put it simply, disappointing and rather dated. The Recaro seats and sueded steering wheel and shifter that our car was equipped with were exceptional, and the boost and lateral acceleration gauges were cool, but the newer, more forward-thinking interiors on recent Cadillacs (See ATS) are all in all just much nicer places to be. The Navigation system was a bit frustrating as well. Two of us worked at it for quite a while on the side of the road, and we still didn’t get it quite right. Worse than the atmosphere or the GPS, though, was the visibility. The steeply raked wedge of the rear window naturally makes seeing out the back pretty tough and, since the doors are way up high, side-to-side viewing is less than ideal as well. Lucky for anyone walking behind it in a parking lot, though, the car comes with a rearview camera system, which admittedly gives a wide view of the area behind the vehicle. But just being inside the CTS-V Coupe, one can’t help but feel that next year’s version will be a welcome improvement. The interior might be a letdown but the engine, predictably, isn’t. The 6.2 liter unit is an LSA V-8 fitted with an Eaton supercharger that has twin four lobe rotors for smoother and more efficient airflow into the engine. That makes for 556 horsepower and 551 lb/ft of torque. 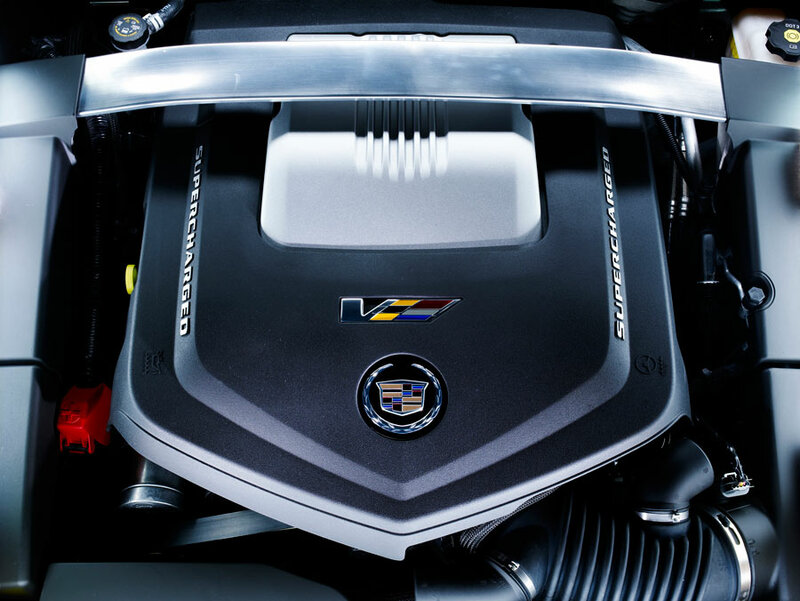 Cadillac says it’s their most powerful engine ever, and it certainly is a beast. It pulls really hard in every gear without being overwhelming, and speaking of gears, the Tremec six-speed is a welcome sight in a new performance car and, for a Cadillac, a surprising one. 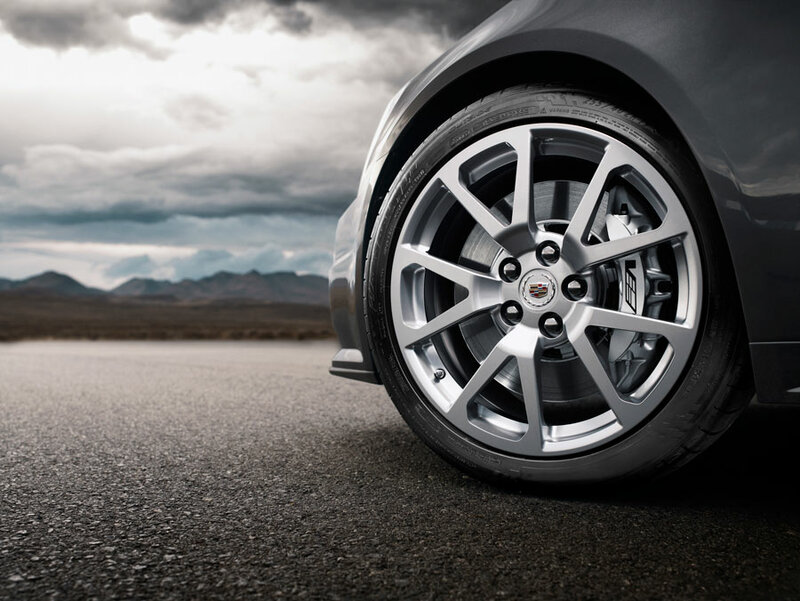 Changes are both tight and smooth, with heel-and-toe shifting a breeze. Combined with the sueded shifter and steering wheel, it’s a rewarding setup. At the same time, though, there’s something about the CTS-V Coupe that somehow makes it feel just a bit weaker than the specs suggest. Maybe it’s the size, maybe it’s something else, but even though the car certainly feels fast and you have to keep an eye on the speedo as you barrel down the highway, it just didn’t feel 556 horsepower fast. The general consensus was that we couldn’t hear enough of the lion of an engine inside the cabin. We know it’s there, so here’s hoping the next series of CTS-V Cadillacs have a little more of the outside on the inside. We’ve been seeing pictures and videos of the CTS-V tearing up the Nurburgring for quite some time, and driving the car proves that this is no mere publicity stunt. The Magnetic Ride shocks are amazing in their ability to tighten up when needed, yet cruise along comfortably when not. 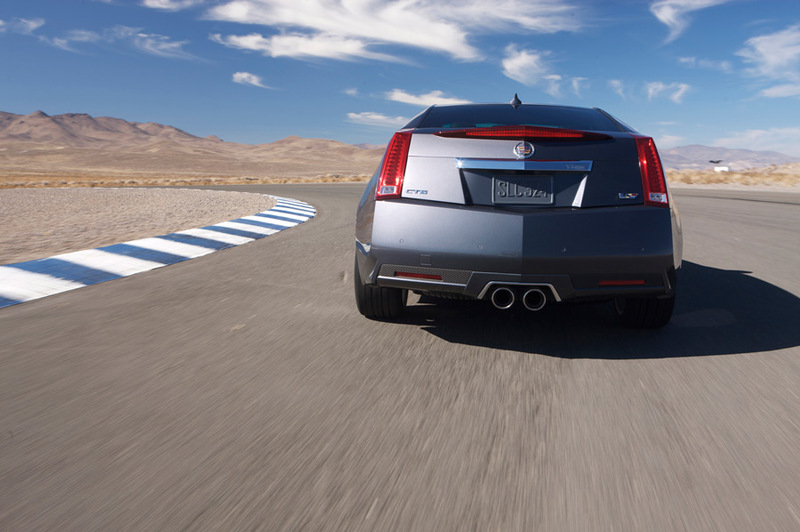 Push the coupe into a tight turn and you’ll be rewarded by more grip than you need on a public road…and then some. Any understeer is flicked away quickly with a stab of the throttle. Another pleasant surprise from this Cadillac came from the brakes. The Brembos (6 piston in front, 4 in rear) are phenomenal, and are two-piece, dual-cast units up front, which combine the performance characteristics of iron with the lightness of aluminum. They are slotted and vented at all four corners, and stop this fairly heavy car with remarkable ease. This car does feel somewhat heavy, but nobody told the brakes that. The CTS-V Coupe isn’t quite a supercar, especially at over 4,200 pounds, but it is an undeniably fast machine that offers more performance than most drivers would probably ever use. It is also a practical, tractable car that can be used every day, not one that overwhelms with excessive power and a brutal ride. It is in the $70,000 neighborhood, however, which makes you wonder what else you could do with that money. A well-optioned Corvette Grand Sport can be had for similar money, and if you need the two extra seats that the Cadillac offers, the smaller BMW M3 is right there as well. The Cadillac, though, is a standout and even with its faults, it’s still an interesting choice for the high-performance coupe buyers.